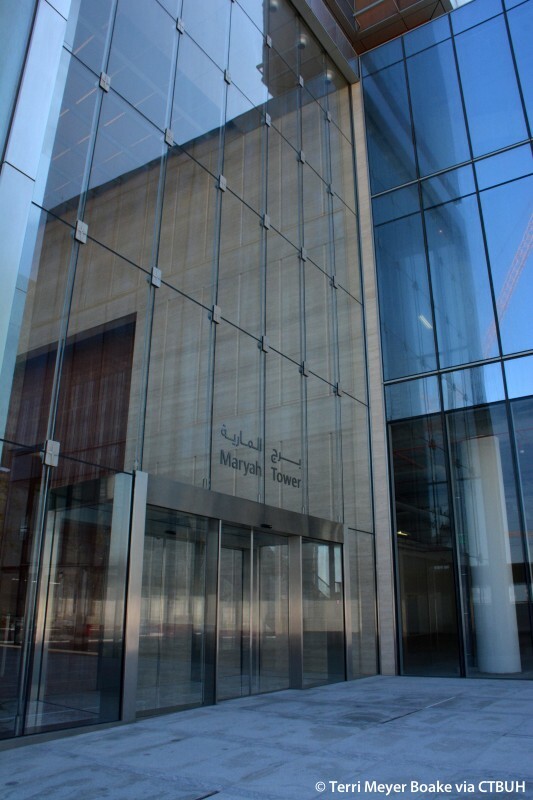 The Al Maryah Tower is a flagship commercial development for the Al Hilal banking network. 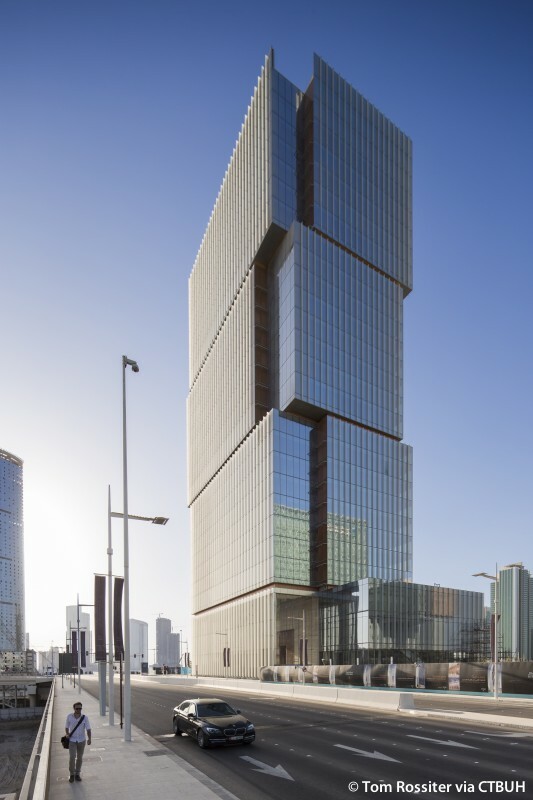 It is located on Abu Dhabi’s Al Maryah Island, situated at the midpoint between Abu Dhabi’s existing downtown district, Reem Island, and the new cultural district on Saadiyat Island. 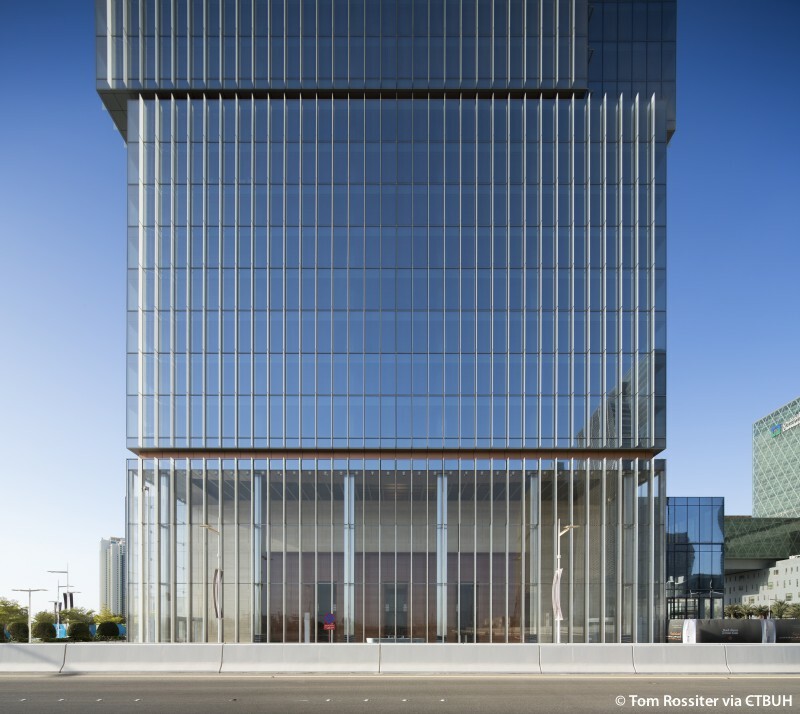 Al Maryah Island is a business, leisure, and entertainment hub designed to meet the city’s commercial and residential needs. 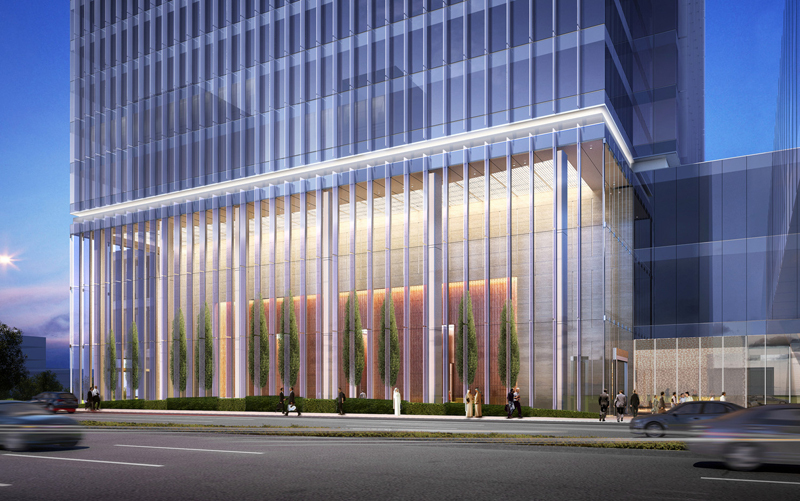 This contemporary office tower is a key element for the district. 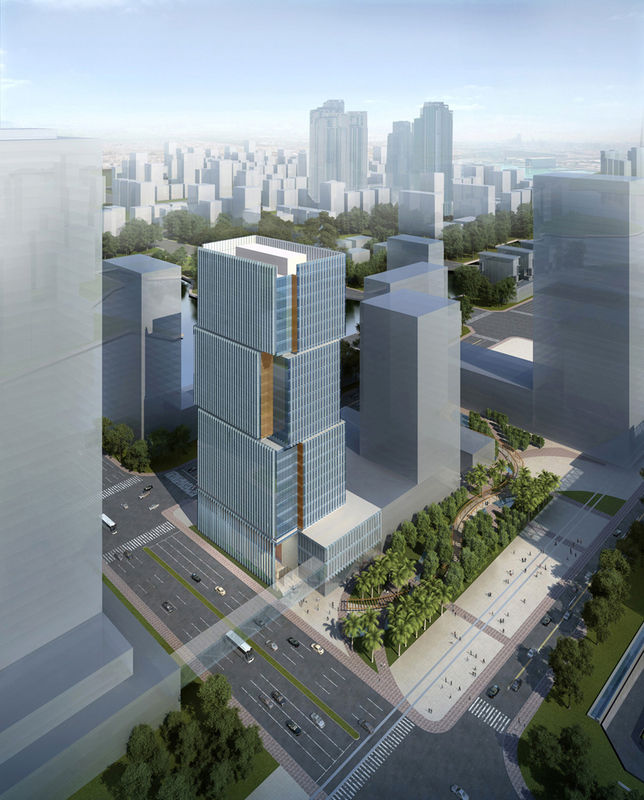 The project is well integrated into the city, with direct access to three primary island roads, and fulfills a need in the capital city for more office space. 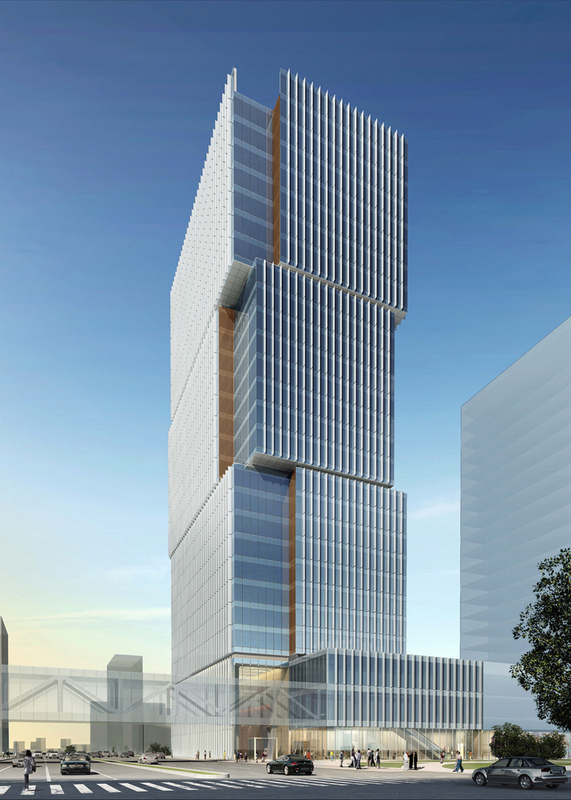 The scheme will be serviced by sophisticated transportation infrastructure, including a planned light rail station. The combination of the nearby P4 roadway and the corner articulation of the building anchor it to the site and give it a commanding sense of presence. 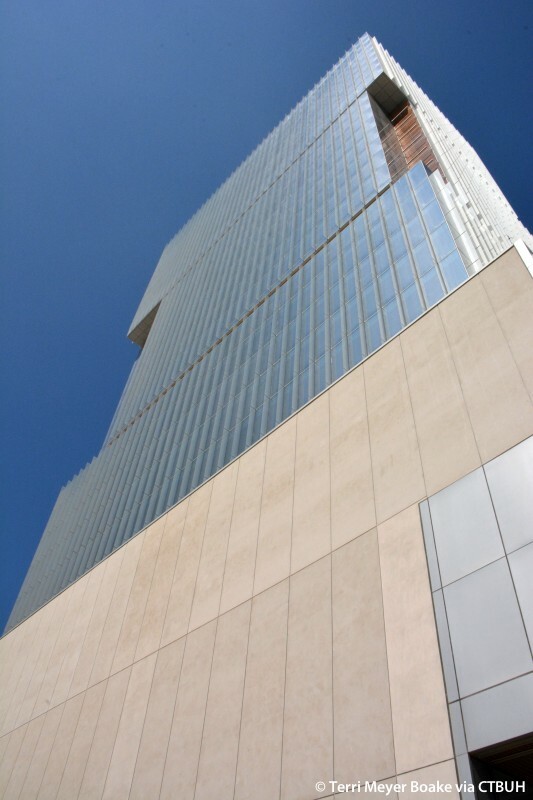 The building’s design offers an original scheme shaped by a combination of the building’s function, site, and contextual influences. 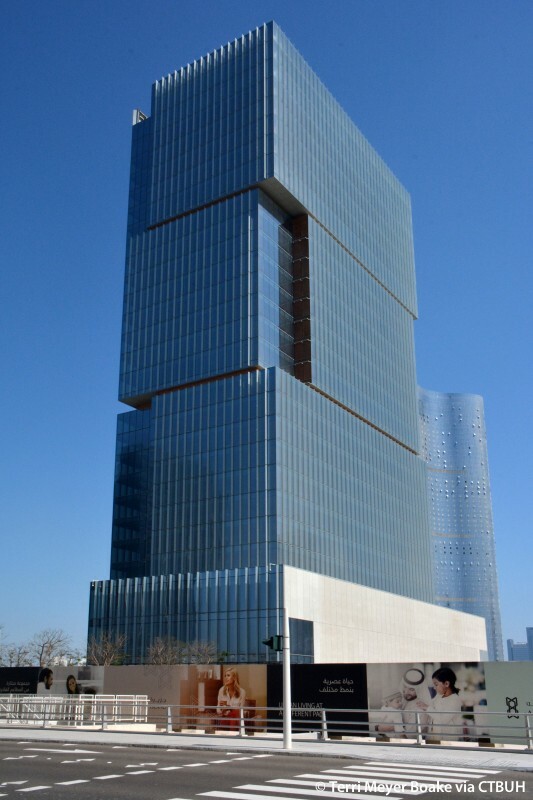 The tower’s composition features stacked boxes that are slightly offset from each other vertically so that it shifts in massing as it rises. 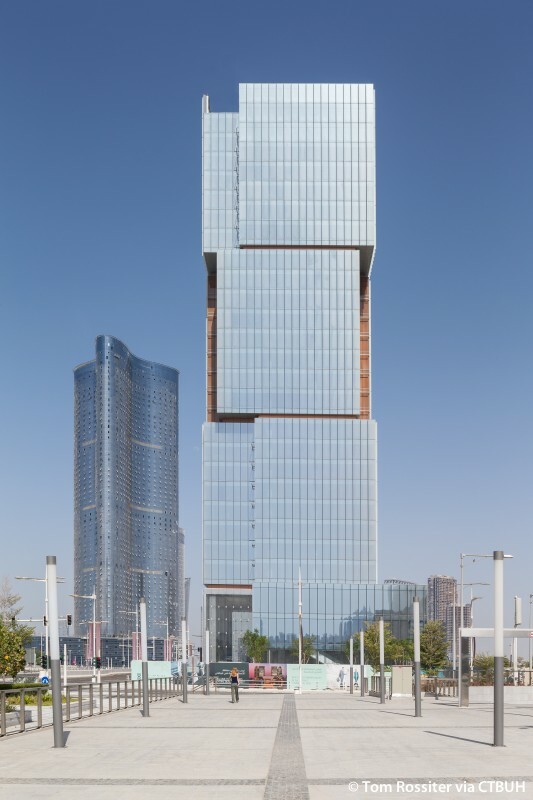 Designed to set the building apart from other towers on Al Maryah Island while also providing efficient, column-free interior floor plates within, these forms derive their interest from a “push-and-pull” effect at the corners. 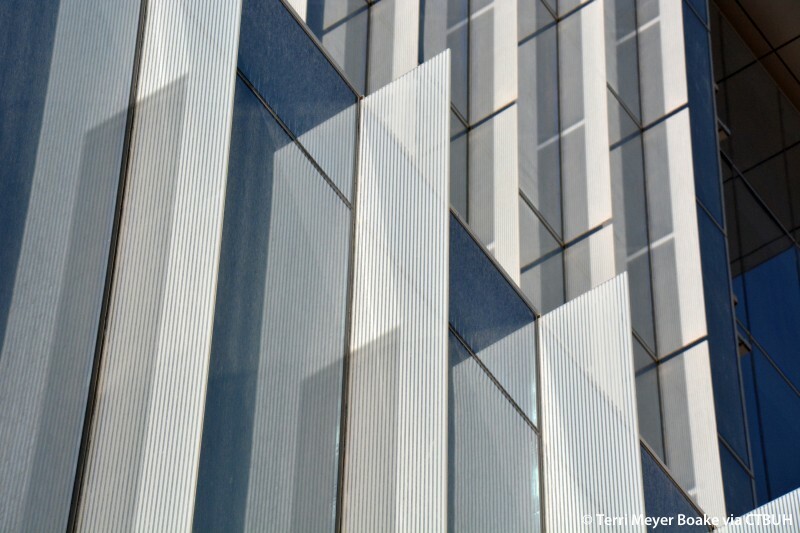 In addition, the building’s façade changes composition at the created voids to accentuate this kinetic, shifted aesthetic. 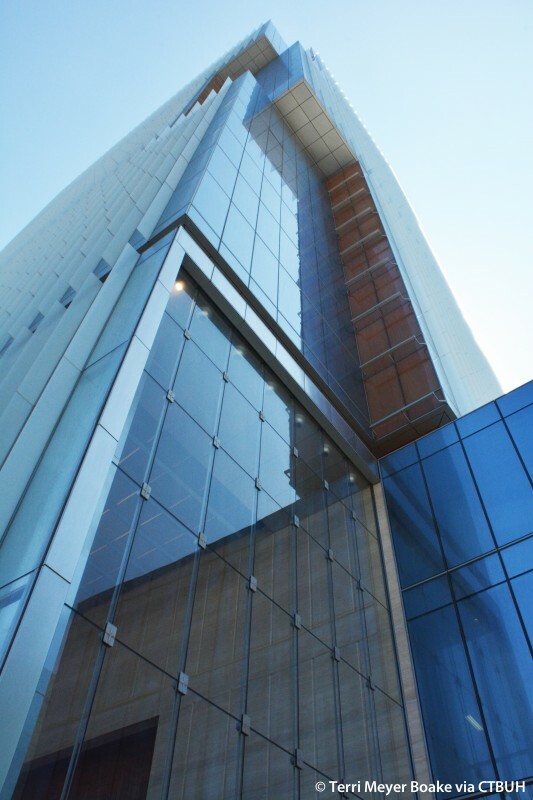 The building incorporates a glass and steel curtain wall system which lends it a sleek, modern feel. 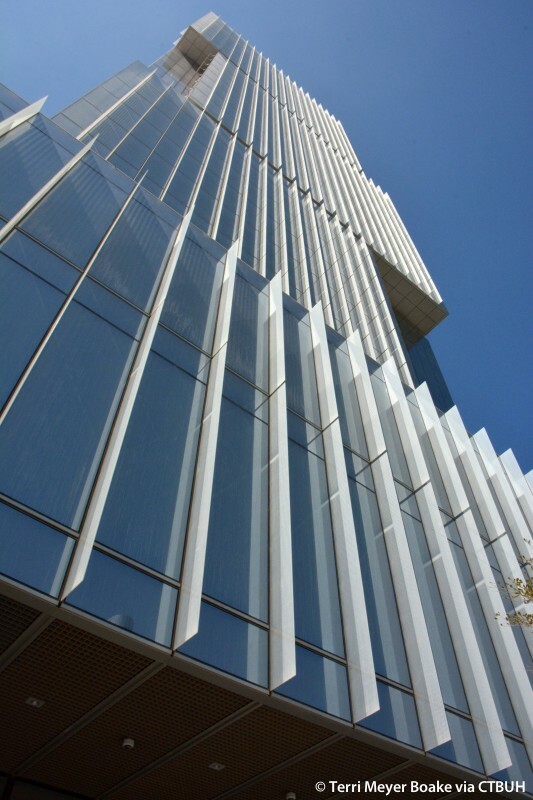 Each façade includes exterior glass fins featuring a white ceramic frit pattern that provides texture. 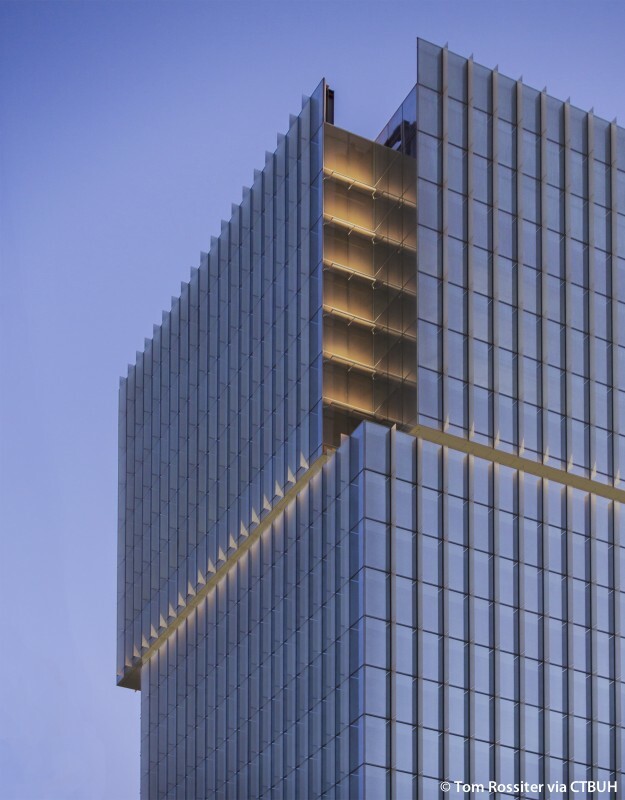 The fritted glass helps enhance the energy efficiency of the building by shading it from intense daylight while providing filtered light to the interior spaces. 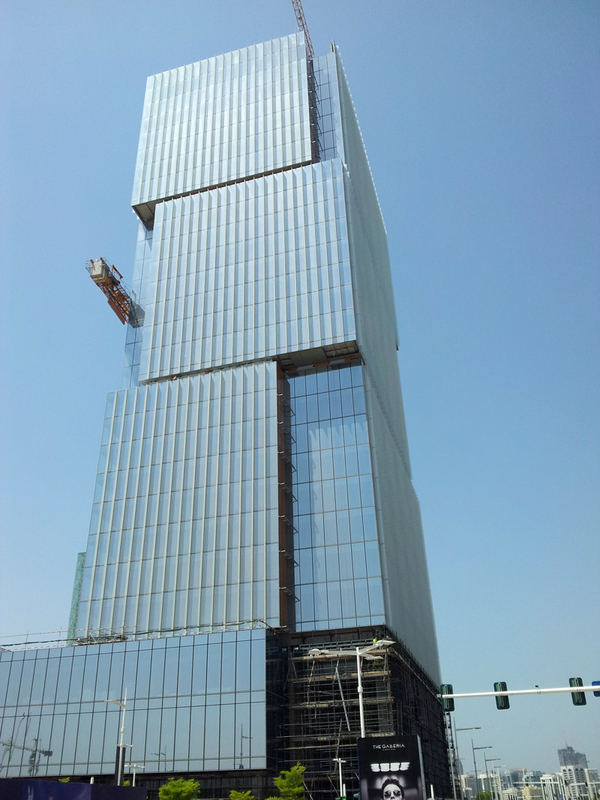 The façade has orange accents, which highlight the dynamic corners and call out the bank’s branding scheme. 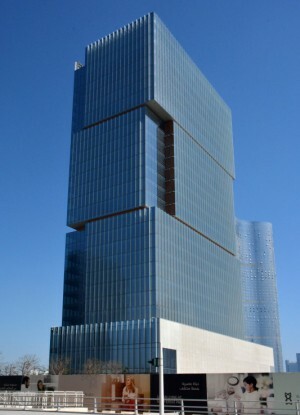 The trio of cubical masses rest upon a podium containing a retail banking facility as well as a dramatic three-story lobby to the north, with pedestrian arcades on the east and west sides. 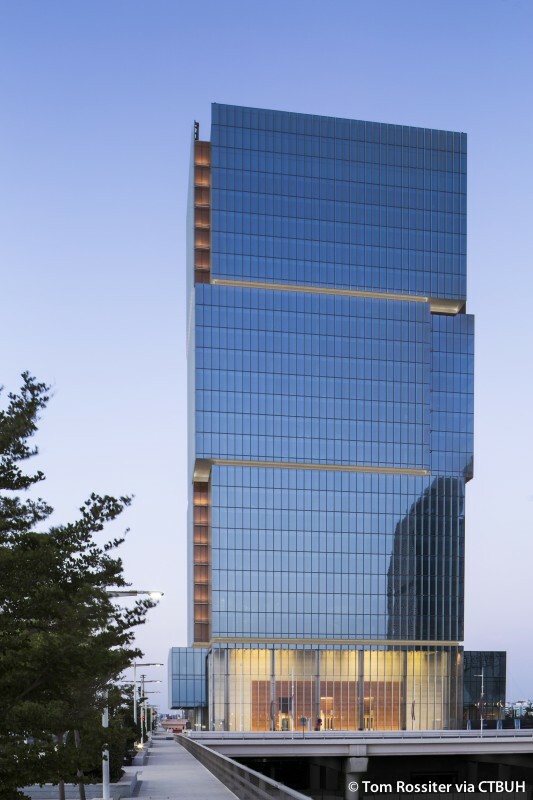 The glass curtain wall offers optimal transparency with floor-to-ceiling glass, creating a nearly seamless transition from the interior to the exterior of the structure. 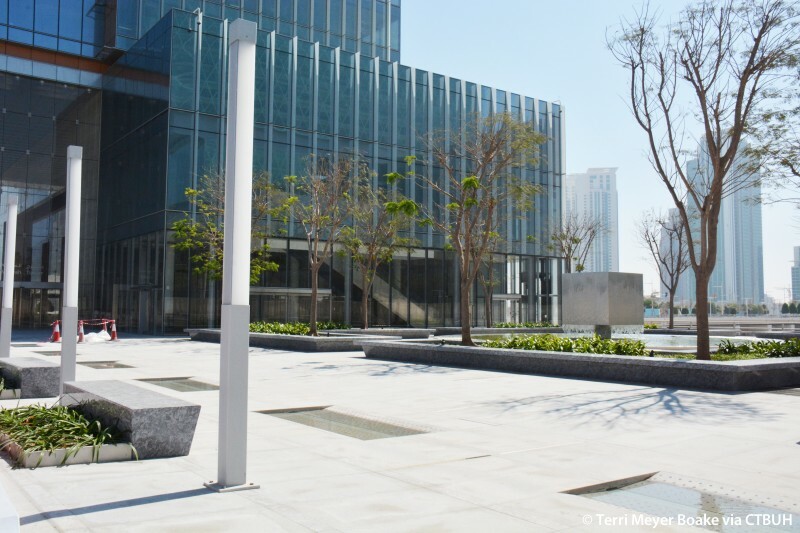 This experience is complemented by a plaza on the ground level. 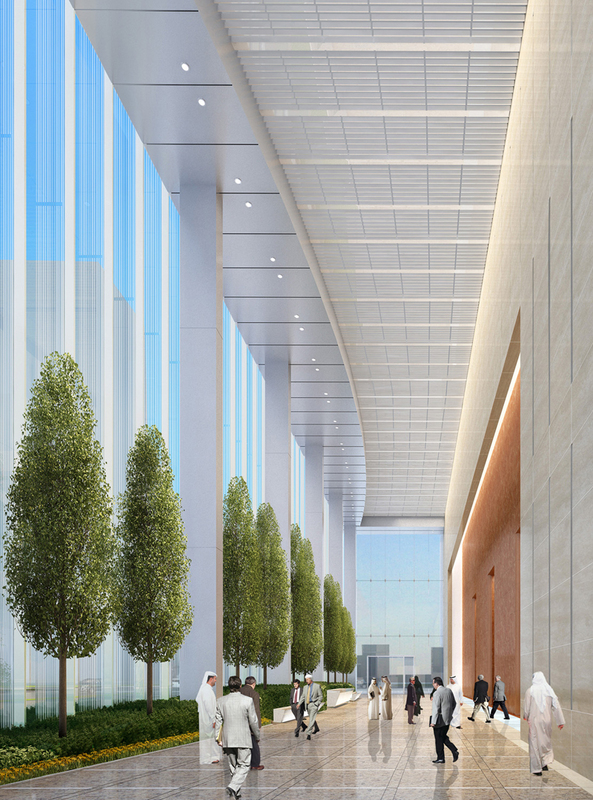 A landscaped park and reflecting pool along the building’s western elevation are intended to draw foot traffic to the main entryway and retail areas by creating an inviting, shaded urban space. Café seating for tenants and visitors helps to further energize this area. 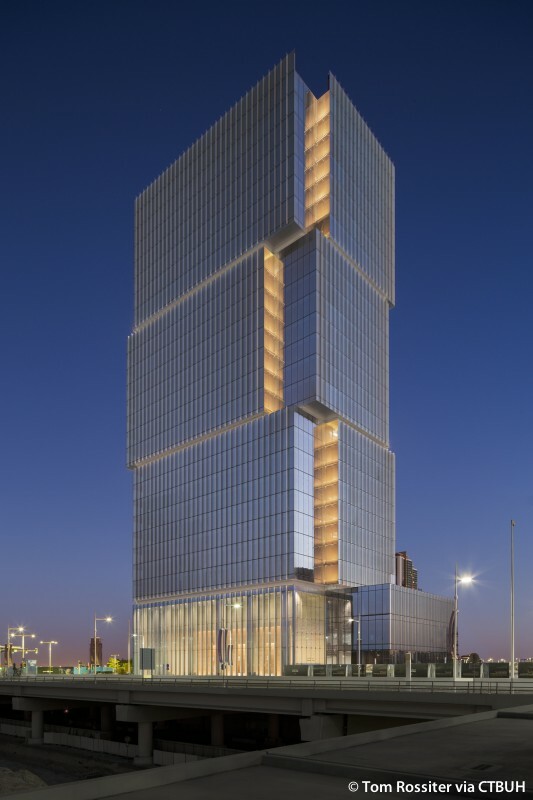 Sustainable strategies include exterior shading, high performance glazing, and energy efficient components for lighting, heating, cooling, pumps, and fans, which all contribute to an energy savings of 12 percent. 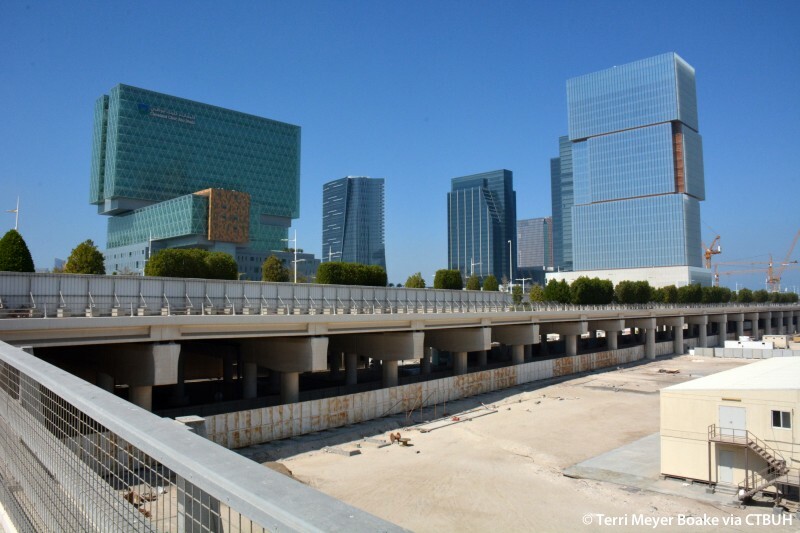 A comprehensive water strategy minimizes the project’s interior potable water consumption. Low-flow fixtures, metering faucets, and dual flush toilets are included for all common rest rooms. Condensate recovery is used to reduce water consumption for irrigation of the park. The site’s shrubs and trees have been selected based on minimal water requirements, and will provide additional shade. 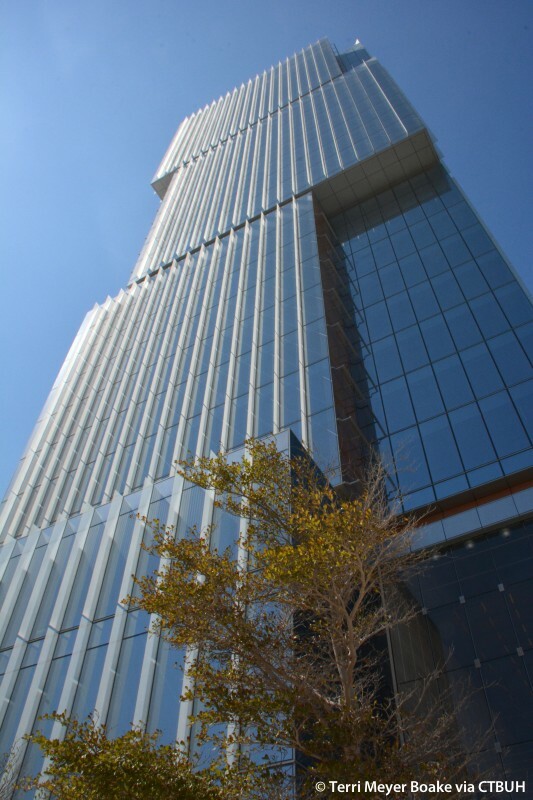 Extensive electrical metering provisions were installed at every level of energy distribution, accounting for all of the building’s electrical consumption and generation. All metering communicates with the Building Automation System, which identifies areas for further optimization.